If you are caught driving without car insurance in Florida, you certainly aren’t alone. State officials estimate 1 in 4 drivers in the Sunshine State don’t have auto insurance as required by law. Driving without insurance is illegal in Florida, and it’s a serious problem that could result in the suspension or revocation of your driver’s license. 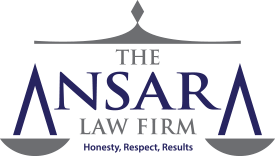 At The Ansara Law Firm, our Fort Lauderdale traffic ticket attorneys will fight to protect your right to legally operate a vehicle in Florida if you are cited for driving without insurance. Depending on the facts of your case, you could be facing hefty fines and a loss of your license for months or even years on end. It’s important that you take action as soon as you receive notice that you have been caught driving without insurance. Although some traffic crimes are frequently prosecuted as criminal offenses in Florida, driving without car insurance isn’t one of them. However, it can quickly spiral into a criminal charge if your license is suspended and you continue to drive. If you can sidestep this outcome early on, you can likely avoid bigger headaches later. Auto insurance is mandatory for those who are driving a vehicle or registering any vehicle with four wheels. $10,000 in property damage liability. Although bodily injury liability is not required by state law, certain drivers (such as those convicted of DUI) are required to carry it, and most carriers offer minimum limits of $10,000 per person and $20,000 per accident. Bodily injury liability coverage pays damages for serious and permanent injury or death caused to others when you cause a traffic accident. Your insurer will pay up to the limits of your crash and will also provide your legal representation if you get sued in civil court. It usually covers insureds driving other vehicle as well as other persons driving your car with your permission. Per F.S. 324.023, financial responsibility for bodily injury or death, any owner or operator of a motor vehicle registered in this state who has been found guilty or pleaded no contest to a charge of DUI has to maintain at $50,000 in coverage for property damage, $100,000 in per-person bodily injury liability and $300,000 in per-accident bodily injury liability. These higher limits have to be carried for at least three years post-conviction. New residents to Florida cannot simply keep their old car insurance. The minimum required insurance has to be issued through a Florida insurance agent employed by an insurance company licensed to sell it in Florida. Most insurance companies are national companies, so usually, you need only ask to have the insurance transferred. It should be noted that Florida’s many snowbirds too have to maintain insurance, as does anyone who has a vehicle in Florida for more than 90 days during a 365-day period – even if those 90 days aren’t consecutive. Registered vehicles have to be insured, regardless of whether they are being used or not. The only way to avoid a driver’s license suspension is to surrender the plate and registration to the local Tax Collector office prior to canceling the policy. What If I Fail to Keep My Car Insurance In Florida? If your insurance lapses or you drop it and don’t get new insurance right away, the DHSMV has the authority to suspend your driving privileges, your vehicle license plate and your registration for up to three years, or until proof of Florida insurance is provided – whichever is first. If your license is suspended because you aren’t properly insured, your reinstatement fee could range from $150 to $500, depending on if you have any prior insurance lapses. It’s worth noting that there is no allowance under Florida insurance law that gives any kind of temporary or restricted driver’s license for those whose licenses are suspended for failure to maintain insurance. Unlike a number of other states, you won’t face criminal penalties for failure to keep insurance (which is probably part of the reason the rates are so high). Still, you’ll want to have your attorney help you address the situation as quickly as possible so you can avoid serious sanctions, including a license suspension. Florida law enforcement agencies regularly have uninsured driver crackdowns where they issue hundreds of citations for driving without insurance. If you present to a law enforcement officer proof of insurance that you know is not current, you could be charged with a first-degree misdemeanor, punishable by up to one year in jail, as noted in F.S. 316.646. If you get a ticket for driving without auto insurance and want to fight it, we’re here to help. There are a number of steps that can be taken to mitigate your damages. This includes securing SR-22 or FR-44 Certificates of Financial Responsibility forms. These are sometimes required by the state and provided by your car insurance company that verifies you have auto insurance liability coverage. Some drivers will be required to keep these filings for up to three years. We can also help you fight any citations for failure to present proof of current insurance and work to negotiate an agreement that gets you back on the road – legally – as soon as possible.